Et voilá, after 3 preparing posts (part 1, part 2 and part 3) I finally try to come up with some kind of valuation for Piquadro. Quarterly letter of Kerrisdale. 200% performance in 2011, good paragraph on struggling retailers. Always a good read: David Merkel ranting against simplistic valuation metrics. The new semester in Damodaran’s valuation class starts on January 30th, don’t miss it. Will this be the slow death of universities ? Vorbemerkung: Ich habe ein Exemplar vom Verfasser zugesandt bekommen und wurde um eine Besprechung gebeten. Ich hoffe und denke, dass es sich dennoch um eine unvoreingenommene Besprechung handelt. Gute Deutschsprachige Literatur zum Thema Bilanzanalyse und Value Investing ist eher selten. Umso erfreulicher ist die Tatsache, dass sich jemand die Mühe macht, sein Wissen und Kenntnisse über Bilanzanalyse, Kennzahlen Berechnung und Unternehmensbewertung in Buchform zu veröffentlichen. Normally it is quite difficult for a private investor to get hold of comprehensive market information. One could try to google and try to collect some articles, but “hard data” is usually only available if you pay. Interestingly, in it’s own presentation one can see that the “Premium / Performance” segment is also the most crowded one. An even better source for market data are IPO filings. In an IPO prospectus, companies usually provide a lot more information than in annual reports, as they have to persuade new investors that this is a exciting market. Luckily, competitor Samsonite actually was IPOed last year on the Hongkong stock exhange after filing bancruptcy in 2009 (and also in 2002 if I remember correctly). The Samsonite story also shows the biggest risk for those companies: Overexpansion and too much lease liabilites, in this case driven by a Private Equity owner. Tumi, currently owned by PE firm Doughty Hanson is currently on the path to an IPO and has already filed its documents for an IPO. To make things more interesting, Samsonite already anounced its interest purchasing TUMI. So we have to additional sources for market information in this case. For Mandarina Duck, the other major competitor from the Piquadro Matrix, currently no financial information is available. It seems to be owned by a PE shop as well. We have a variety of competitors in the categories and geographic regions in which we operate. We believe that all of our products are in similar positions with respect to the number of competitors they face and the level of competition within each product category. Depending on the product category involved, we compete on the basis of a combination of design, quality, function, price point, distribution and brand positioning. Our biggest global competitor in the travel goods category is Rimowa, a German company. We also compete with Samsonite in Europe, the Middle East, Africa and Asia-Pacific. In the premium luggage and business cases category, we compete with Bally, Dunhill, Ferragamo, Gucci, Louis Vuitton, Montblanc, Porsche and Prada. In the business case category, we also compete with smaller brands in specific markets. In the U.S., our main competitors are Victorinox and Briggs and Riley. In Europe, the Middle East and Africa, our key competitors are Mandarina Duck and Piquadro. In the Asia-Pacific region, competition is fragmented. In Japan, our two key competitors are Porter and Ace Brand. We also compete with Coach across the luggage, business cases and accessories categories. We believe that our primary competitive advantages are favorable consumer recognition of our brand amongst our targeted demographic, consumer loyalty, product development expertise and widespread presence in premium venues through our multi-channel distribution. We may face new competitors and increased competition from existing competitors as we expand into new markets and increase our presence in existing markets. 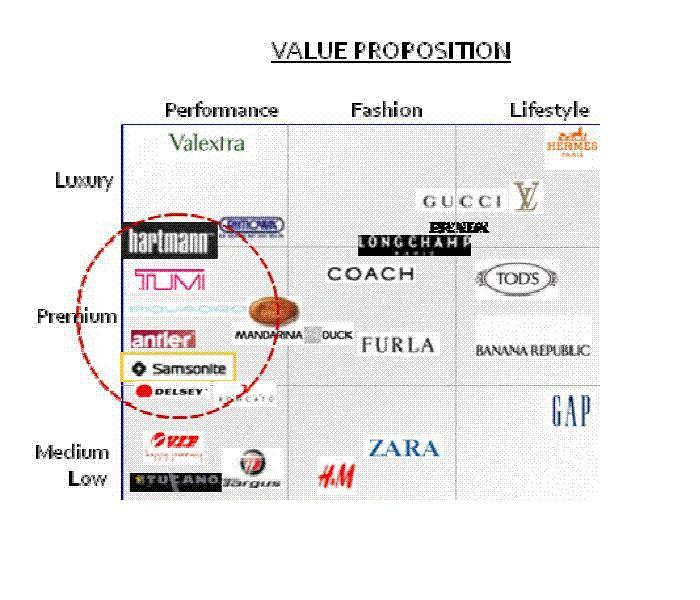 So again, we do not see any “hard” moats but rather some fuzzy brand recognition and customer loyalty aspects. 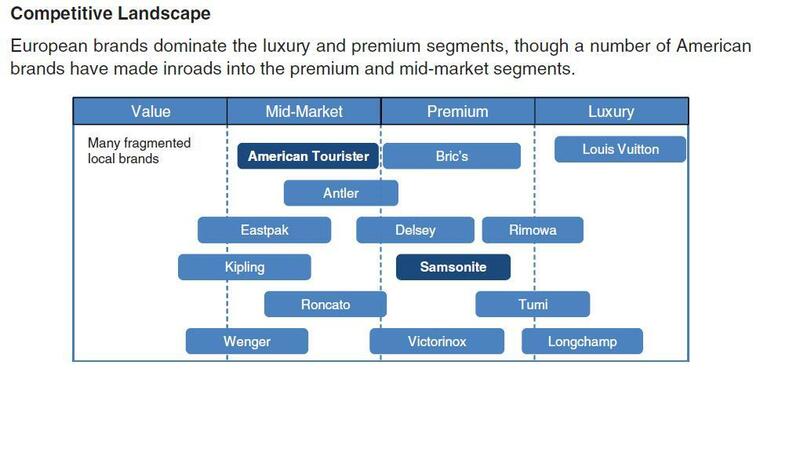 Even more interesting is the very detailed IPO prospectus of Samsonite. This is a “treasue trove” of interesting market data. Barriers to entry into the luggage market are generally low, which has contributed to the fragmented nature of the industry. Key challenges for an entrant or an existing company are investment in brand awarness, innovation in new products, access to quality producers, and developement of an effective national / local retail network. So here the “market leader” tells us there are no barriers to entry. So no “moats”. Period. The Industry overview section of the filing is really interesting and comprehensive (p-90). Samsonite itself does not yet realise Piquadro as competitor, neither Mandarina Duck. Piquadro and Mandarina Duck are only mentioned among others which are shown having a combined market share of 74.5%. Side remark: Anyone who had the problem at an Airport baggage claim to find out which of the 25 identical black Samsonites is the own bag knows that this is more “mass market” than anything else. So the big question is now: Should I stop now with analysing Piquadro because there is definitely no “objective” moat ? I would say, no, because for some reason, Piquadro has been able to grow, maintain high margins and produce free cashflow. When we continue to evaluate the company we should however incorporate a certain “normalisation” of returns anad margins. Also the whole market segment seems to be quite attractive as even in “good old Europe” some nice growth is expected in the coming years as indicated before which can be incorporated int he valueation to a certain extent..
We do not employ traditional advertising channels, and if we fail to adequately market our brand through product introductions and other means of promotion, our business could be adversely affected. In 2010, we spent approximately 3% of our net sales on advertising and promotion expenses. Our marketing strategy depends on our ability to promote our brand’s message by using store window campaigns, product placements in editorial sections, social media to promote new product introductions in a cost effective manner and the use of catalog mailings. We do not employ traditional advertising channels such as newspapers, magazines, billboards, television and radio. If our marketing efforts are not successful at attracting new consumers and increasing purchasing frequency by our existing consumers, there may be no cost-effective marketing channels available to us for the promotion of our brand. If we increase our spending on advertising, or initiate spending on traditional advertising, our expenses will rise, and our advertising efforts may not be successful. In addition, if we are unable to successfully and cost-effectively employ advertising channels to promote our brand to new consumers and new markets, our growth strategy may be adversely affected. 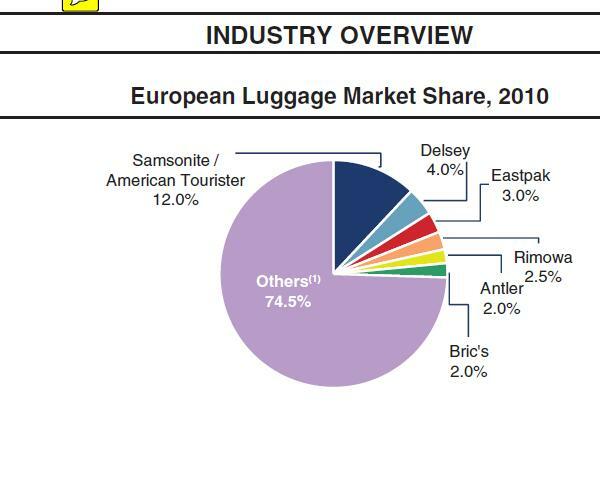 Interestingly, the “Market leader” Samsonite spent almost 9% of revenues on marketing in 2010(see IPO fact sheet), Piquadro around 5%. Samsonite focuses basically to almost 100% on the wholesale sales channel, Tumi has reached a 50/50 split between wholesale and single brand stores. Very interisting is the fact, that Piquadro just hired a seasoned TUMI executive for international brand expansion. This is really interesting. Piquadro is the most efficient and most profitable company of this “Peer group” based on “simple” metrics. I will follow up with a valuation approach in the next days. After a first glance at Piquadro and many interesting comments from readers, I wanted to follow up un a couple of the points raised. Petroplus bankruptcy – sign of weakness or strength ? Today, a big European oil refiner, Petroplus, filed for bankruptcy. This was not really unexpected. Instead of analyzing if the bonds are an interesting investment (the Distressed Debt investing blog has a great post) I wanted to quickly focus on possible secondary consequences. What is scary is that instead of finding a resolution, banks decided to accelerate and seek to control the underlying assets, in what continues to confirm that all of Europe is desperately battling a wholesale collateral crunch, and banks will do anything to procure any viable assets, even send the obligor in bankruptcy court. Out of my own experience, I would conclude the exact opposite. For me, this is rather one of the first signs that banks are not in the “extend and pretend” mode anymore, which means they just extend loans in order pretend that everything is fine. Putting a company into bankruptcy in the first step locks up a lot of capital in the underlying assets (much more than in a bad but performing loan). Capital charges for a direct stake in a refinary or a non performing loan in bankruptcy are much higher than for any performing loan. So the decision to let Petroplus go into bancruptcy is for me actually a sign of strength for the participating banks which is the first step in really cleaning up corporate loan books. I am not yet “ready” to really analyse bank equity, but apart from all the headline noise, the underlying fundamentals seem to shift in favour of the banks. Reader Snapple made some interesting comments with regard to the DJE fund and also published an analysis here. – DJE used lower values for problem funds than stated NAVs, so my discounts might be too conservative. Snapple also linked to a article which stated that ALL problem funds have been valued below official NAVs. However, based on the half year report, this was only true for the P2 Value funds whereas the TMW Welt and the Axa were valued at official NAV. – the ABN Henderson Fund certificate matures in 2012, so one could assume complete payback in 2013. However, this didn’t really change much in my model. As Snapple calculated in a slightly different way, 50% of the NAV might be paid within the next 12 months. For the portfolio, I will increase the purchase limit to EUR 5,50 EUR, as so far I was not able to purchase a lot at prices below 5.40 EUR.